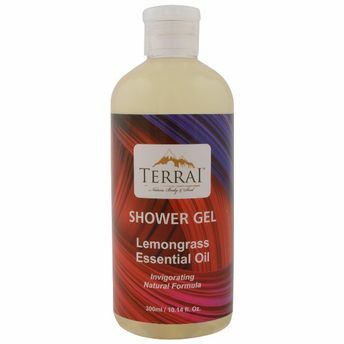 Terrai Lemongrass Shower Gel has been formulated to provide the ultimate shower experience, pampering you with rich lather, ultra moisturizing for a soft feel and gently clean and fragrance your skin. It is made without harsh chemicals, animal ingredients or animal testing. Its mild and natural formula, containing Lemongrass Essential Oil, is designed to nourish and cleanse the skin without taking away the skin's natural moisture. It works wonders on the skin, leaving a fresh fragrance for that invigorating feeling.